One thing we love about RVing is the time we spend together as a family. I’m not just talking about those bright shining moments (like hiking in national parks), I also really appreciate the fun times IN the camper. Even though we spend plenty of time using our electronic devices, we also have some favorite games that our family loves. Our boys are 10 and 13, so these recommendations are great for elementary-aged kids through teens. I also made sure to really focus on games the adults can enjoy playing with the kids. Today’s post focuses on non-card games, and the next post will be about our favorite card games for the camper. Concept: Roll the dice and earn points for specified number combos. 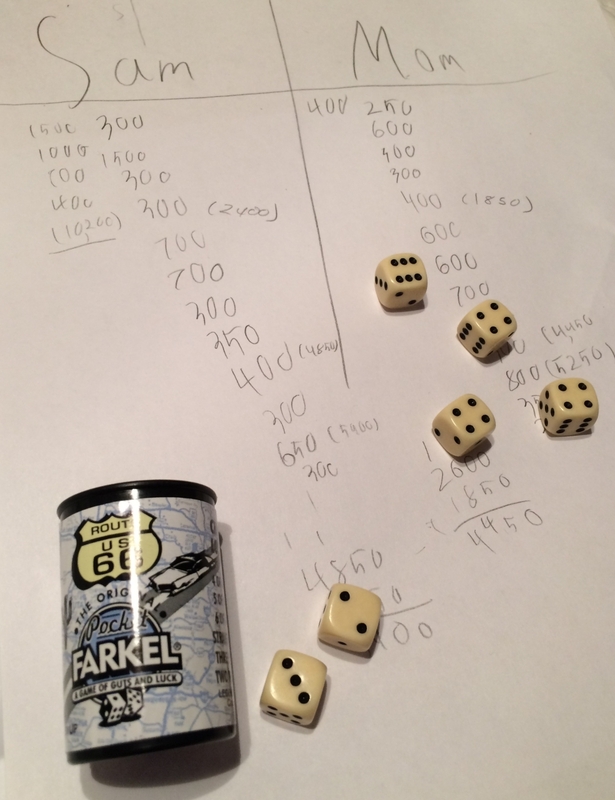 Players take turns trying their luck, but if they push too far, they just might strike a ‘farkle’ and lose their points for that round. 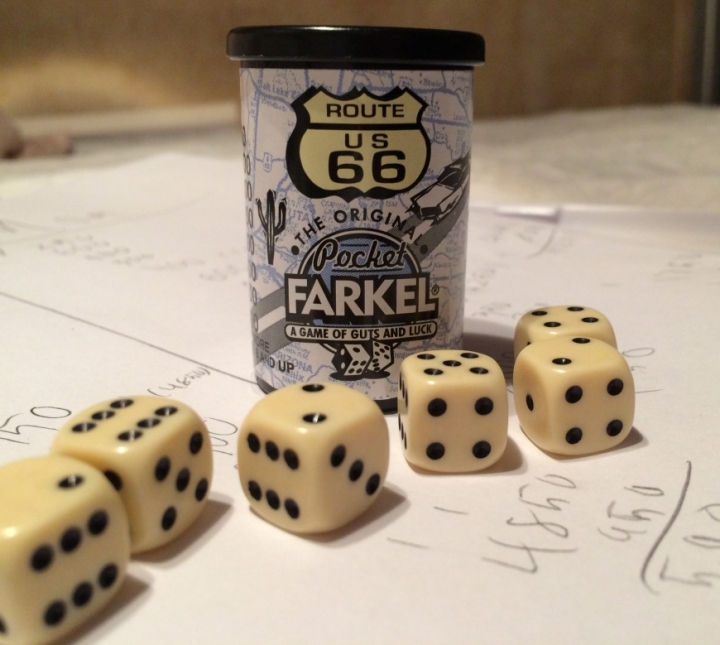 Portability: Farkle comes in a container the size of those little black film containers we all remember from our youth, making it perfect for your RV. Our container has the rules printed right on the side of it, so we don’t even have to worry about losing the directions. Appeal: Farkle can be played by 2 or many more players, making it adaptable for your friends/family. The rounds go fast because you just roll your dice and add up your points. You can play to a set score or decide to play a set number of rounds, making it as quick or as lengthy as you desire. There’s an element of risk taking, as each player decides whether or not to keep rolling during their turn. It’s a really simply game, but quite fun! 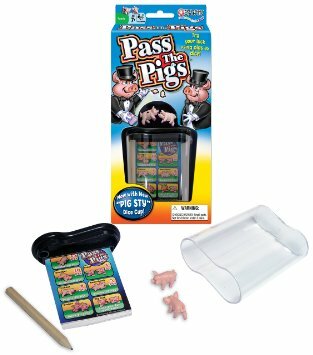 Concept: Your Pass the Pigs set will come with 2 tiny pigs and a scoring sheet. Roll the pigs and earn points based on how they land. Weirdly fun! Appeal: The pigs are cute. That’s really the main appeal of this game. Other than that, it’s fun because it’s a quick, simple game anyone can play in a small space. Concept: First, you must note that Heads Up is an app. This game is a digital form of charades. One player holds his/her phone or tablet above his/her head. The screen displays a term that the other players act out. You try to speed through as many concepts as possible in the allotted time. Portability: It is perfect for RVing since there is no physical game to carry around. You do need a little floor space for the shenanigans that will occur! Appeal: This has all the appeal of the traditional charades game but with a modern twist. As the players are acting out the terms in front of the screen, it records a video sometimes. The kids think it’s hilarious to see their crazy acting on the screen. Not all of the game packs are as easy for kids to understand, so you may be limited to certain categories (we especially like one where they make animal noises). This never fails to make us break out in giggles! For Christmas, I really want a magnetic checkers set. Our boys love checkers, but it’s hard to play in our camper since we keep the dinette folded down as a bed. A magnetic set would be perfect! Do you have a favorite game? Let me know in the comments. We’d like to add a few new ones to our trailer before our next road trip. Posted in: Product Reviews. Tags: Games, product reviews. 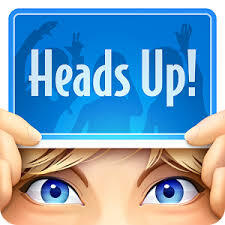 We love Heads Up! The others are new to me….thanks for the recs! We’re much more likely to get around to actually playing games in the trailer than we are at home….I guess it’s because we’ve yet to stay anywhere with functional internet ;). Glad to share new ideas. Like you, we play more games in the trailer, too. I love that! I’m always looking for some new ones so I can avoid the games I dislike (like Monopoly–oh the horror!). Stay tuned for another post about our favorite card games. We love playing games and we will have to buy those! Right now we are hooked on playing different domino games, Tenzi, and Shut the Box. I haven’t heard of Tenzi or Shut the Box. We will have to check them out before our next trip! Thanks! I love love Rummikub- It’s like the card game Gin Rummie, but with dominoes- A very thinking game! Thanks for stopping by! We haven’t played that, so I will put it on our list. Sounds like something out family would enjoy.